As a keen freshwater angler I moved to Queensland in 1988. My aim was to set-up a freshwater fish hatchery and enjoy some fishing. However I was to be disappointed as the freshwater angling in Queensland was pretty much limited to Barramundi and Sooty Grunter fishing well north of the Bundaberg region where I had settled. Therefore I still traveled to the southern states to find reliable fishing. This “reliable” fishing was for the introduced trout. Native fish in their natural habitat were very hard to find and to guarantee a fish when fishing for native species was unrealistic. However to my great satisfaction a stocking program was in its infancy. There was an anticipation of great things to come. Well, for some years now a few “in the know” fresh water anglers have been enjoying some of the best freshwater fishing in Australia, and for native fish! Great fishing is now virtually on the doorstep for most people in Southeast Queensland. Writing this piece is a sacrifice to me as now the secret’s out! Silver Perch, Golden Perch, Australian Bass, Barramundi, and Saratoga have been stocked extensively. Even more native species are being considered. The stocking program has been a spectacular success! The Aquaculture Association of Queensland’s hatchery members have stocked the region with millions of fingerlings. An experienced angler can pretty well guarantee them self a catch each time they go out. Even the humblest of anglers will get that thrill of a hook-up, may-be, even a BIG ONE. AAQ hatcheries have also seen the dawn of a new farming venture. Farming of Silver Perch and Jade Perch for the table is becoming a successful industry. You may be able to visit one of these farms during your travels. Contact the AAQ if you would like to arrange a visit. The farming of native fish has focused attention on the eating qualities of our native angling species. Some interesting facts have been uncovered, or perhaps just highlighted. The early settlers of Australia were well aware of the value of native fish as a food, even as potential farming species. In 1916 Gale noted that they had the potential to submit to pond culture. They were also aware that there were times that their flavour was not so good. As early as 1831 Major Mitchell, while on an expedition, recorded in his journal that Silver Perch were an excellent eating fish. However on the return leg of his journey Silver perch caught at a lagoon had an “off flavour,” and were not edible. So, try your catch, if it has off flavour don’t waste any more by keeping what you won’t eat. Return them to the water for another day. Next time they may taste great. All freshwater fish now have a bag limit, yes even those little ones you might want to put in an aquarium. So watch for size and bag limits and good fishing! It is illegal to stock the wrong fish. In Queensland unlawful stocking under section 90 of Fisheries Act 1994, can attract fines up to 2000 penalty units each unit is $75. If a hatchery operator sells fish knowing that that they were going to be released into a water where they are not permitted, that can be investigated under section 7 of the criminal code. 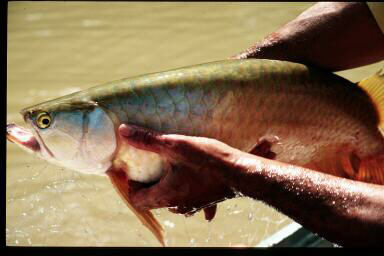 For mosquito management using Australian native fish click here. For a list of hatcheries that are able to supply fingerlings to stock dams, click here.